For someone pretending to dabble in investigative journalism, the last thing they need is to make the rash mistake of spraying round accusations that cannot be stood up. That much could seriously damage anyone’s credibility; to then try and ignore the mistake and hope that all will blow over only serves to make matters worse. If you make a mistake, own up and if necessary make amends. If only everyone was so sensible. 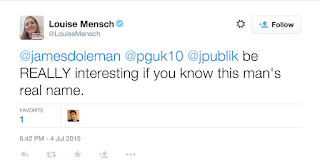 One person who is not for listening to such ideas, though, is (thankfully) former Tory MP Louise Mensch, who, having spent the last fortnight putting her case in support of biochemist Tim Hunt, went totally gaga yesterday evening and laid herself open to not one, but two potentially damaging legal actions. And it was totally self-inflicted. 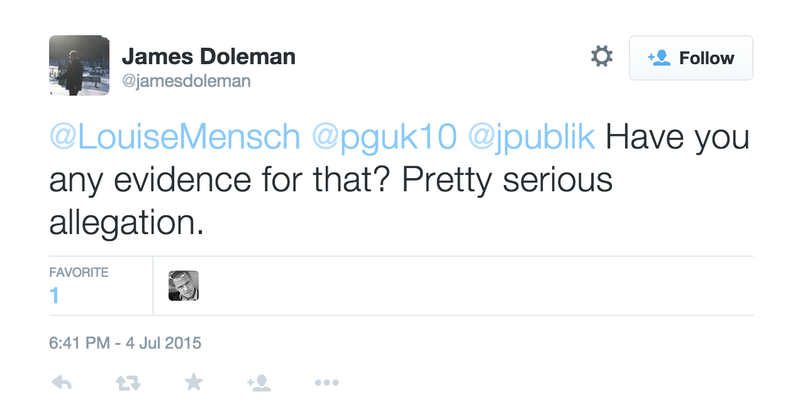 This reply was equally bizarre: “No much worse than that. Ask him”. Then it got plain silly: “No. 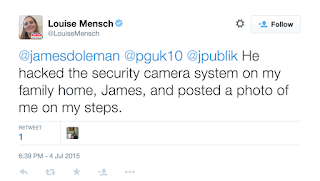 Jpublik is a hacker who hacked the security cameras of my home, James, to stalk me”. 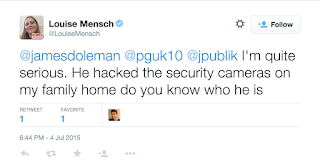 Full disclosure here, folks: this person is, shall we say, known to me, and he ain’t done any hacking. 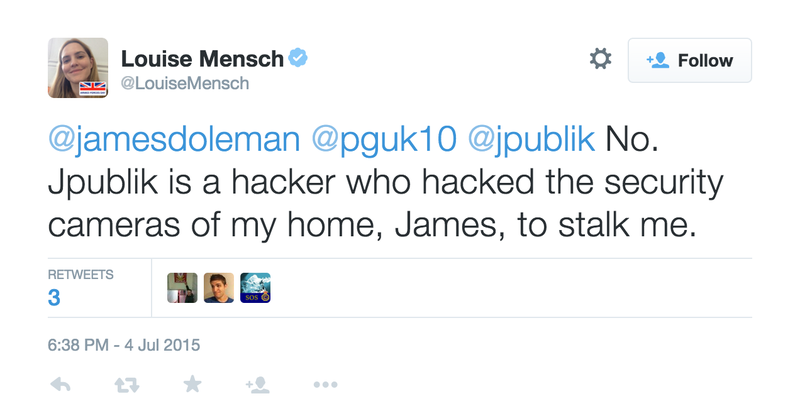 I suspect he’d have difficulty hacking his own front door. Come to think of it, so would I, but as Clive James might have said, I digress. This was a totally untrue claim. 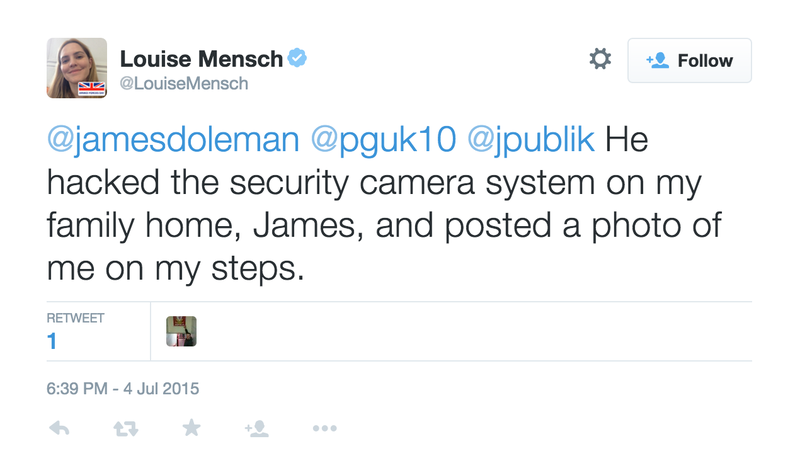 And there was more: “He hacked the security camera system on my family home, James, and posted a photo of me on my steps”. No he didn’t. But do go on. “be REALLY interesting if you know this man's real name”. Yeah? 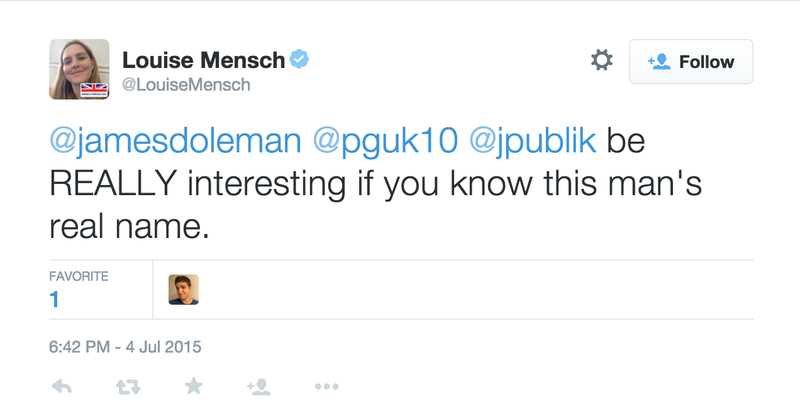 So Ms Mensch could formally make a total arse of herself? It’s wrong. Say sorry. She wasn’t up for that yet: “I'm quite serious. He hacked the security cameras on my family home do you know who he is”. He’s never been to the USA, so this would have been a challenging one. Could she provide evidence? 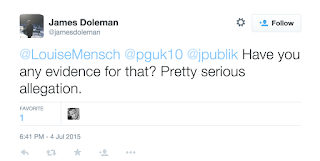 James Doleman mentioned the e-word to her: “Have you any evidence for that? Pretty serious allegation”. 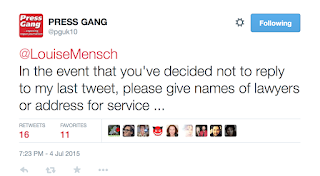 Ms Mensch answered in the affirmative. So her target challenged her directly: “Furthermore post NYPD report online. I'm giving you permission if it's regarding me”. 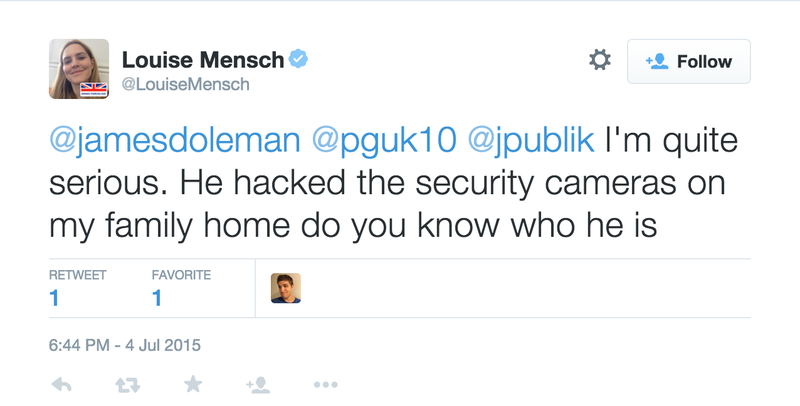 That’ll give us all a good laugh, because, as I’ve said, he’s not hacked anyone or anything. Meanwhile, Paddy French of Press Gang, who Ms Mensch included in her original “hackers” response, showed his displeasure at the accusation: “Please tweet that you are not saying that @pguk10 editor Paddy French is a hacker. 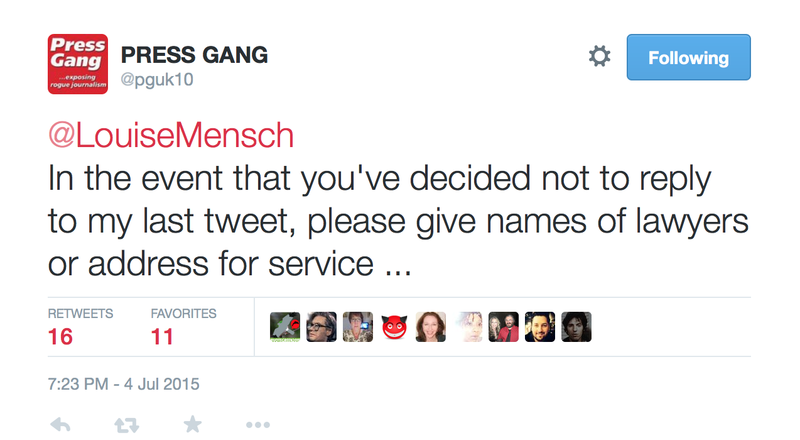 Otherwise litigation beckons … In the event that you've decided not to reply to my last tweet, please give names of lawyers or address for service”. No reply or apology means that process continues. 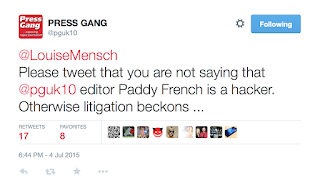 Both Ms Mensch’s targets are taking legal advice with a view to a defamation action. And the longer she leaves it, the worse it will be. Oh, and she can forget the “it’s only Twitter” excuse. 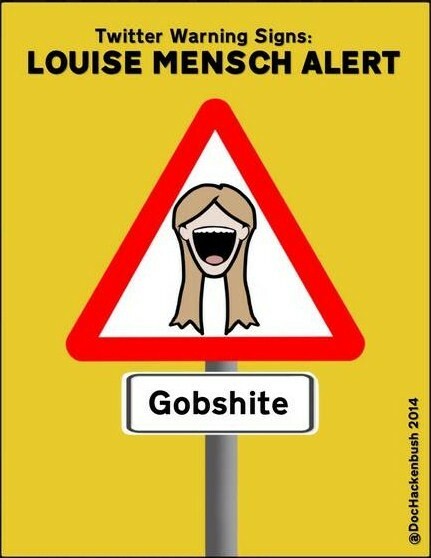 Just remember what happened to Sally Bercow. Don't know why anybody bothers with the woman. She's nothing but a neocon birdbrain a la Sarah Palin. Lose credibility? Surely you have to have it first before you lose it? 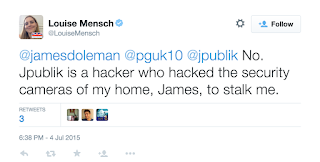 As for hackers and stalkers - judging by recent trials Murdoch's merry men weren't above hacking their own, it all being part of the competitive culture laid down from above. Perhaps she should be more careful of who she works for? As Louise Mensch is a US resident, would a defamation action out of the UK carry any weight? 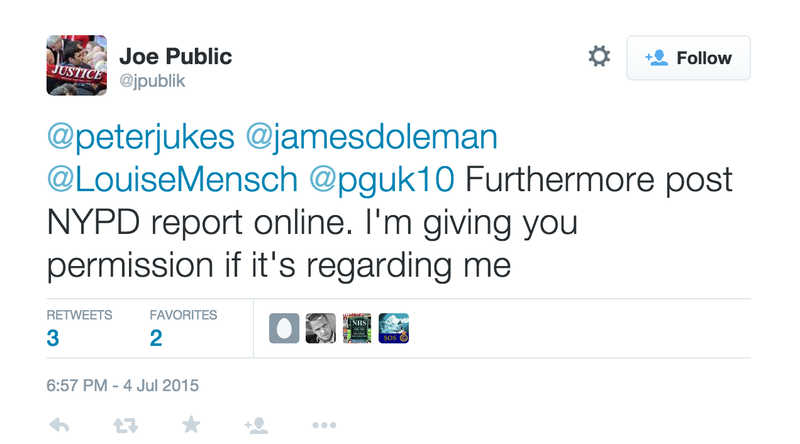 "As Louise Mensch is a US resident, would a defamation action out of the UK carry any weight?" 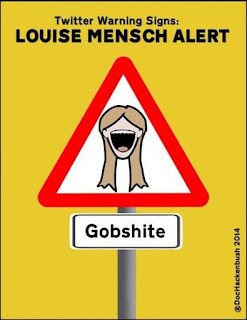 Johnlyons121, well if she's defamed a person resident in the UK (or even not), and that defamtory material is seen in the UK (twitter) then a defamation action can be brought in the UK and if won would cost Mensch a whole load of money.